And we’re back! After a super long blog hiatus, Mr. Foodie and I are back to thinking, making, and writing about food. What have we been up to? Well it is not a coincidence that our blog dried up right around the time I defended my dissertation last year. You can now call me Dr. Foodie! We are both glad to be on the other side of that milestone. Since then I’ve returned to teaching as an adjunct full time, and I have a new journal article coming out on my research. I’m also on the academic job market <insert horror movie sound here>. Mr. Foodie started a new job last year and he’s enjoying the new experience (although his work schedule keeps us on our toes with 10 day stretches and occasional overnight shifts). I’m still not sure exactly why we stopped blogging about our foodie adventures other than I think I needed some down time after graduating and to get used to our new work schedules. Even that didn’t stop me from posting occasionally to Instagram (@fairfaxfoodie), but I really missed the practice of blogging. I may have also put way too much pressure on myself with this whole blog thing in the past. I like creating something great, if course, but I fell into a comparison trap with other food blogs that crippled me for a while. It also stifled me. I want to write about more than just food here as this long-winded introduction demonstrates, but I kept thinking I couldn’t because that’s not what other successful blogs do. I’ve come to realize that I need this creative outlet. A lot. It helped me through my dissertation, and now I need it again as I wait to see how the job market plans out. Wait to see what the new year brings us. Wait to see what new adventures Mr. Foodie and I take together. How disappointing is it to order the seasonal fruit off a restaurant menu only to get melons over and over? I know they’re inexpensive, but seasonal fruit should reflect what delicious produce is in season right now. 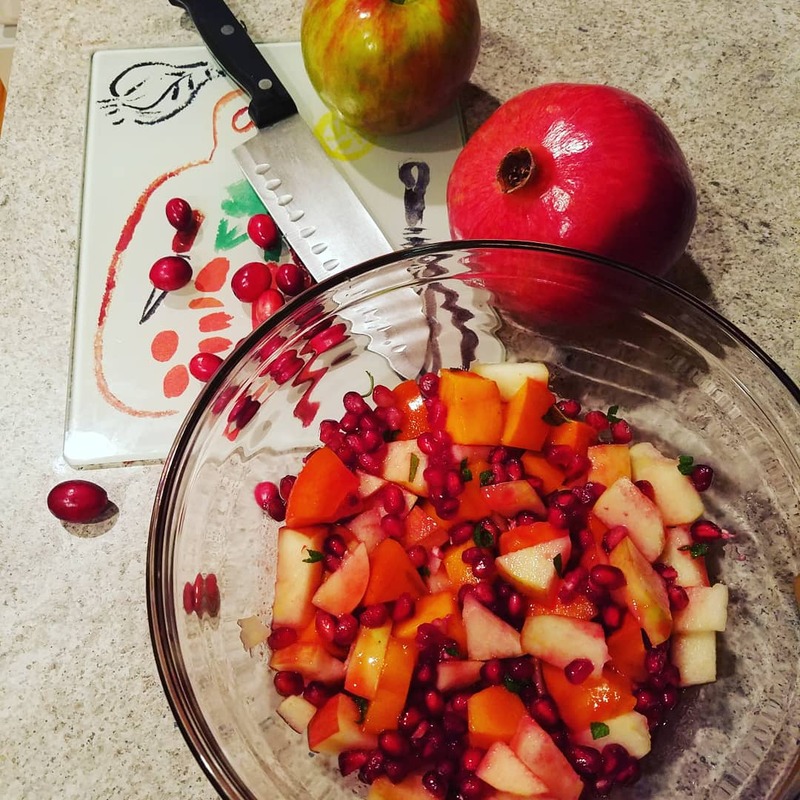 My mom joined us for dinner and holiday movie watching mast night, so I made garlic butter mussels with crusty French bread and this seasonal fruit salad. It was a big hit! Put diced fruit and pomegranate seeds/juice in a bowl and set aside. In a small sauce pot, cook cranberries, sugar, and sage leaves until cranberries burst and syrup forms. Strain cranberry mixture into cup. Chop remaining sage and sprinkle over the bowl of fruit. Dress the fruit with the cranberry syrup to taste (I used all if it in mine). All of these fruits are in season this month, and they work so well together. The crunchy apple and soft persimmon with the tart little jewels of pomegranate seeds provide textual interest and a sweet/tart balance that is out of this world. The sage is subtle in the syrup but makes the whole dish sing its seasonal tune. Persimmons aren’t around that long, so grab them while you can!